I checked out Betty's Book of Laundry Secrets from the library quite a while ago, and have been wanting to share my book review with you for quite a while. This book is written by Betty Faust and Maria Rodale, with Betty, an elderly woman of 76, still doing Maria's family's laundry, along with doing several other people's laundry as well. Betty has been doing laundry for herself and others just about all her life, and this book shares all her accumulated years of laundry wisdom. The book is very small and compact, with lots of illustrations so it is a very short read. Basically, the book goes through many of the same topics I've discussed in my laundry tips section of this website, going through all the steps of how to do laundry. Each short chapter discusses a different step in the process, from laundry supplies, sorting, laundry stain removal, washing clothes, drying clothes, and finally folding them. It is a nice overview of the basics of laundry, kind of like a written Laundry 101 course. Although you can obviously get the same information elsewhere, and in more detail (including on this site) it is a quick read, and sometimes a good overview is what we need to get the big picture. 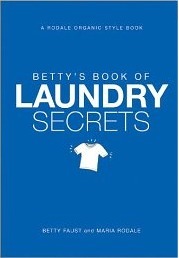 I don't know that I would buy Betty's Book of Laundry Secrets as a reference for my home library, but it was worth reading as a check out from the library! If you have read this book and have some additional thoughts, please share them in the comments. In addition, you can share your own recommendations and reviews of laundry and cleaning books here. Join in and write your own page! It's easy to do. How? Simply click here to return to cleaning book.